Whole Foods entrance, Downtown Silver Spring, MD, March 14, 2012. (Donald Earl Collins). Well, at least as far as the Silver Spring Whole Foods store is concerned. After eleven and a half years, I’ve decided to no longer shop at this Whole Foods location. Now, knowing me, you might think it’s because of Whole Foods’ neo-con founder, who somehow doesn’t believe in universal health care or worker’s rights. Or maybe it’s because Whole Foods’ distribution practices of shipping in coffee from Colombia and olive oil from Lebanon, Greece and Italy isn’t exactly good for the workers in those countries, not to mention the environment and my wallet. Or it’s because I see the ways in which the Silver Spring Chamber (of Secrets) of Commerce has warped Downtown Silver Spring into a pedestrian’s nightmare, of national chain businesses with primacy over downtown residents. 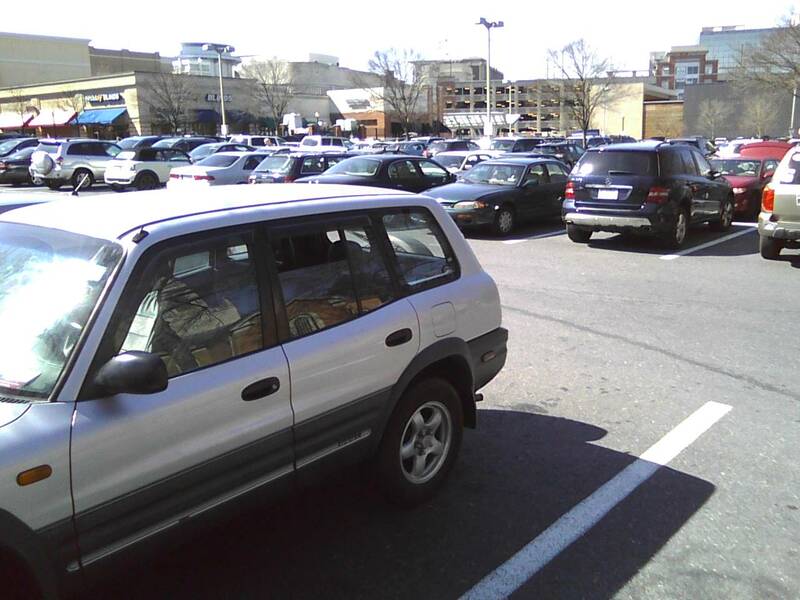 Parking lot area for Whole Foods-Silver Spring, St. Michael the Archangel Catholic Church, Strosnider's, CVS, about 80% full, March 14, 2012. (Donald Earl Collins). But it’s none of those important and oft-thought-about issues for me. 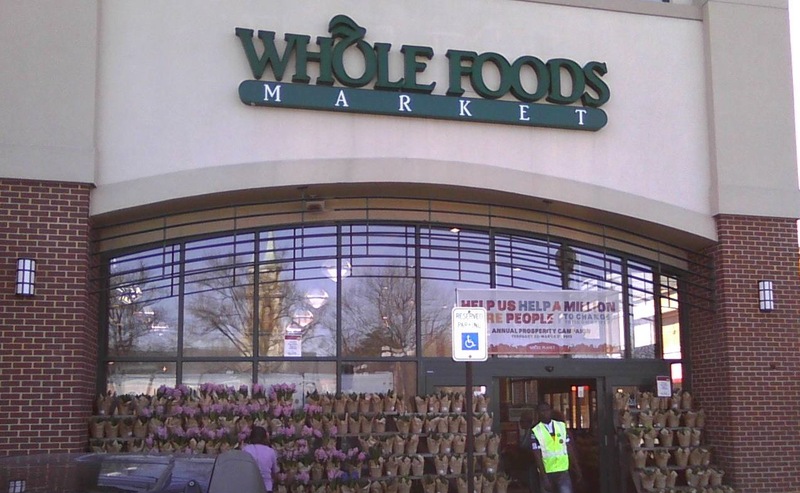 I still plan to shop at other Whole Foods stores in the DC area, albeit much more rarely than before. It comes down to two simple issues: inconvenience and customer service. We live three blocks away from the Silver Spring Whole Foods, and so it’s actually easier to walk there to shop than to drive there. But if I happen to be doing a combination shop, where I often hit two or three stores to buy about $120 in groceries on a Saturday or Sunday, that means using the Honda Element, which also means that there’s no way for me to park anywhere near the store. This isn’t just on the weekends. Even on the days I’ve walked over, whether after work, after dropping Noah off at school, or at the end of the day, the parking area looks as if folks are preparing for a Nor’easter. I’ve actually seen customers get into actual fights over a parking space. It’s that crowded and chaotic there. The store itself often has looked like the parking lot over the years. Lots of entitled people walking lazily down aisles, as if Whole Foods rented the space out to them for the afternoon, all while stepping in front of you for an item on the shelf without saying “Excuse me,” stepping on my foot for good measure. Or of beleaguered Whole Foods staff members in the meat, fish, deli and bakery departments, often with the weary look of waiters working at some country club, all while attempting to meet the whimsical expectations of the privileged class of customers before them. But it’s the actual responses of the folks who work there now that’s been most disgusting.Two months ago, a cashier with name tag “Tai” rang up my groceries at the Silver Spring Whole Foods. I was left with my reusable bags while quickly trying to slide my debit card, enter my information and pay for groceries. When I had a second to try to hand Tai my grocery bags, she didn’t take them, and started with another customer as she handed me my receipt, bags in hand and no groceries bagged. “What, do I have to ask for you to bag?,” I then asked. “Duh!,” Tai said with a pause. All while begrudgingly bagging the last of my groceries. “This kind of treatment is ridiculous, and your attitude’s unacceptable,” I said, ready to beat her up in an alternate universe. I tweeted this incident to Whole Foods Montgomery County that same day. No response. I emailed the Silver Spring Whole Foods management about the incident the following day. No response. So I boycotted the store for over a month. Only to shop there last week and have some cashier tell me to take my headphones off after I had already said no to giving money to a Whole Foods charity. Headphones, by the way, which were never on to begin with. 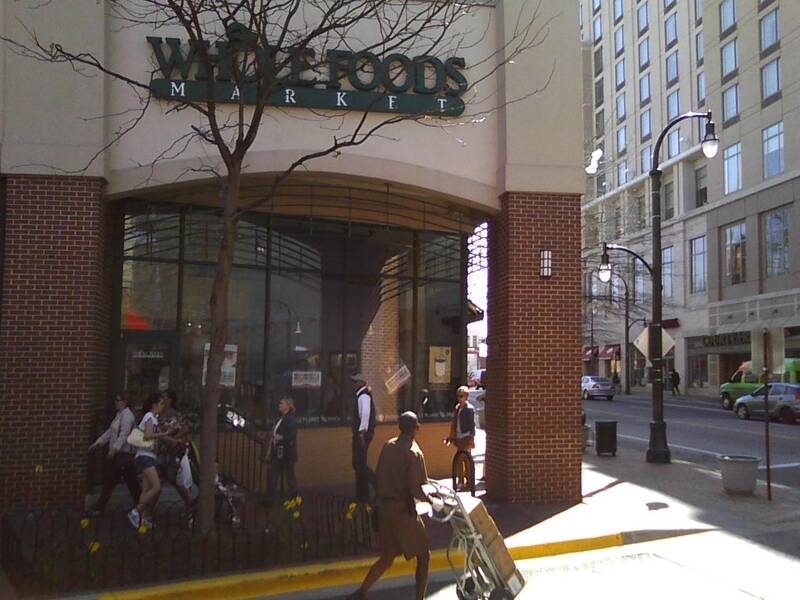 Side of Whole Foods-Silver Spring adjacent to Courtyard by Marriott on Fenton, March 14, 2012. (Donald Earl Collins). This was hardly what the Silver Spring Whole Foods was like when it opened on September 6, ’00. Then, the management and the staff seemed overjoyed to provide their services. Now, it’s as if they believe that they are the only game in town, as if my money has to go into their cash registers. In other words, it’s like shopping at a really expensive version of CVS. I’ve been to Whole Foods’ from the Union Square one in New York to others in the DC area, in Atlanta, in other parts of the country. I’ve never been treated as if I didn’t matter except at the Silver Spring store. Apparently the smugness of the corporation that is Whole Foods and the entitlement that is the Whole Foods shopper has also infected the Whole Foods staff at the Silver Spring location. The truth is, I had put up with a bit of the first two for years, but the truth is, I should’ve never put up with any of it. So, I’m out and I’m gone.